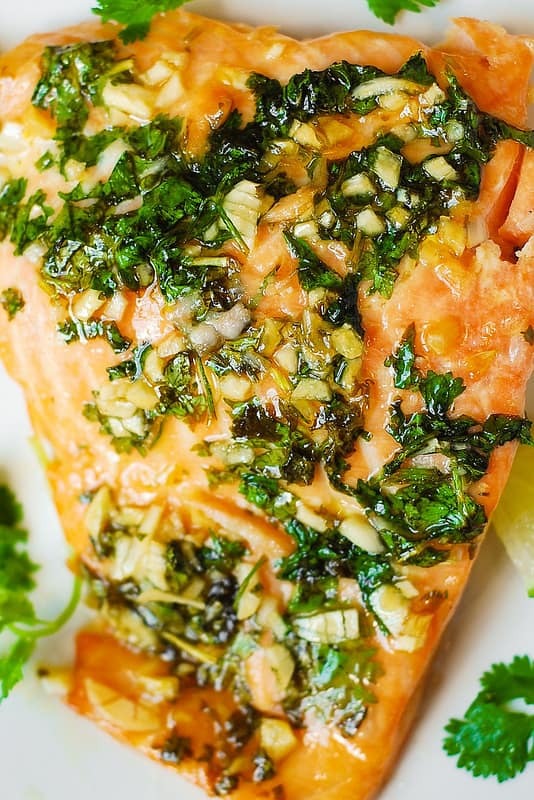 Cilantro Lime Honey Garlic Salmon baked in foil – easy, healthy, gluten free recipe that takes 30 minutes from start to finish! 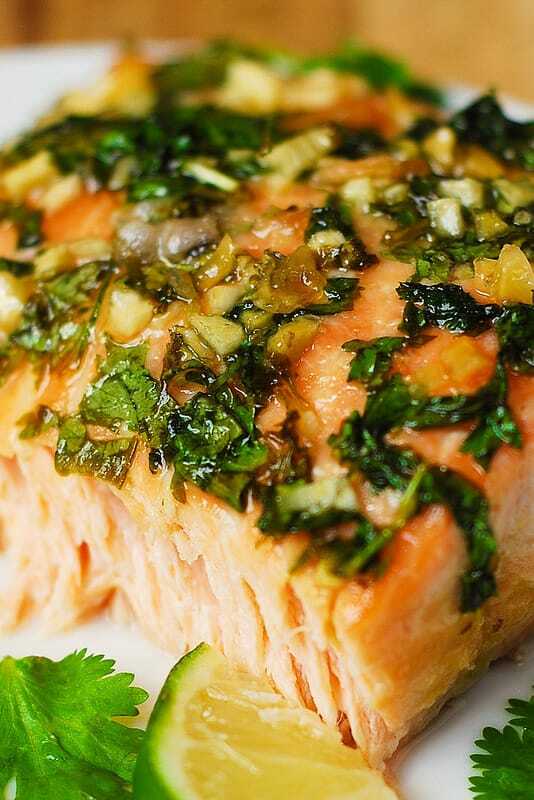 Serve the salmon with rice or greens on the side! 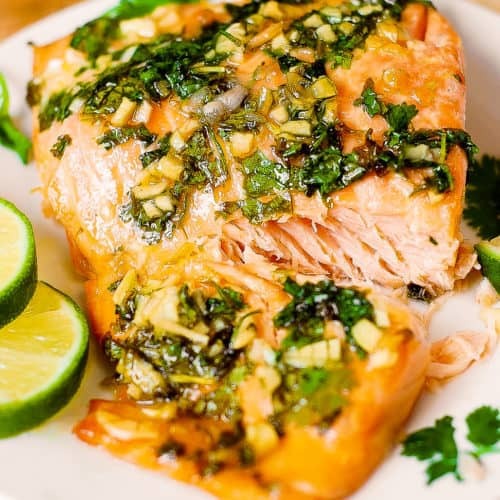 Cilantro, freshly squeezed lime, combined with honey and garlic and salmon creates a really winning combination of flavors! 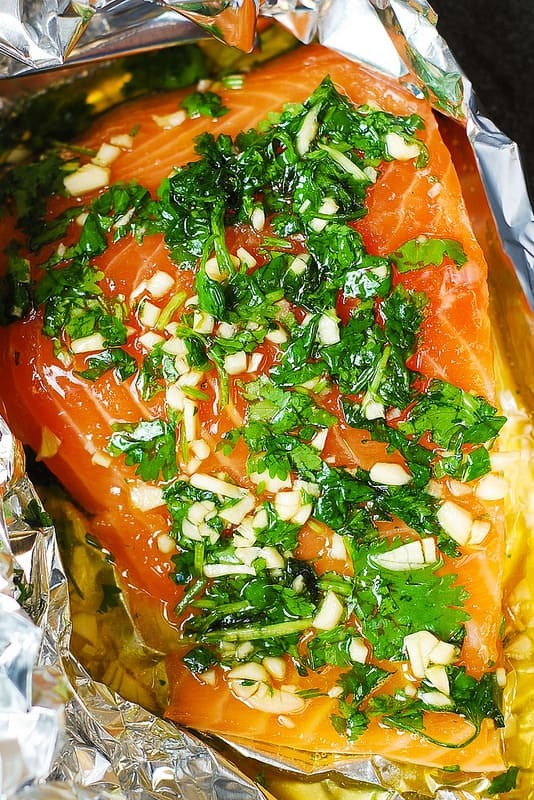 This cilantro lime salmon baked in foil is so easy, you can make it in 30 minutes! 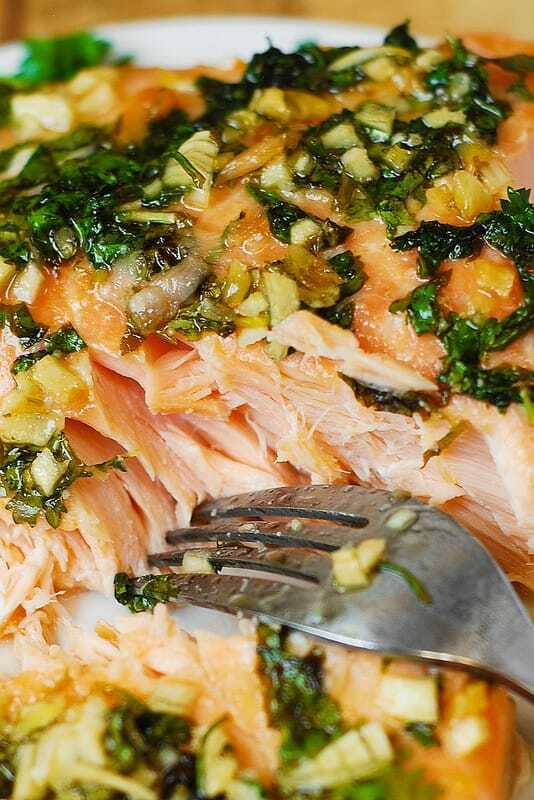 Want an easy recipe for cooking salmon? 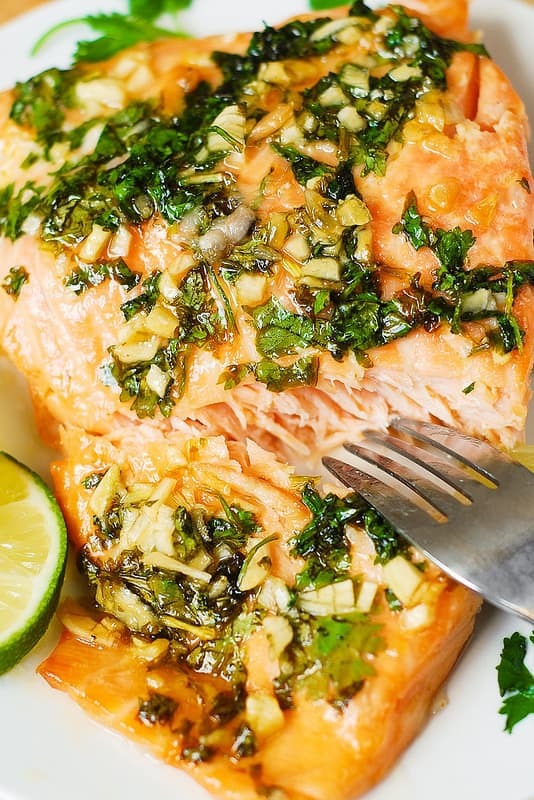 Try this cilantro lime honey garlic salmon baked in foil. Healthy, gluten free recipe that takes only 30 minutes from start to finish . I am so glad you enjoyed this recipe and that you liked honey and garlic combination! I am trying not to cook with foil. 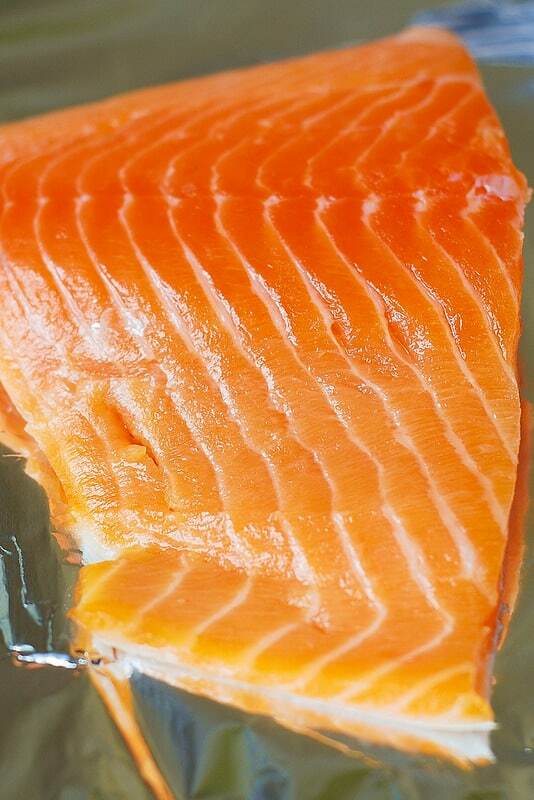 Can’t this be made in a small glass dish with the salmon tightly next to one another, or on a piece of parchment? Yes, you can definitely make this in a small oven-safe glass baking dish with salmon tightly next to one another not to lose the juices. You can also use the parchment paper and just seal them really well (or place them tightly next to one another in a baking dish). This recipe was absolutely delicious!!!! 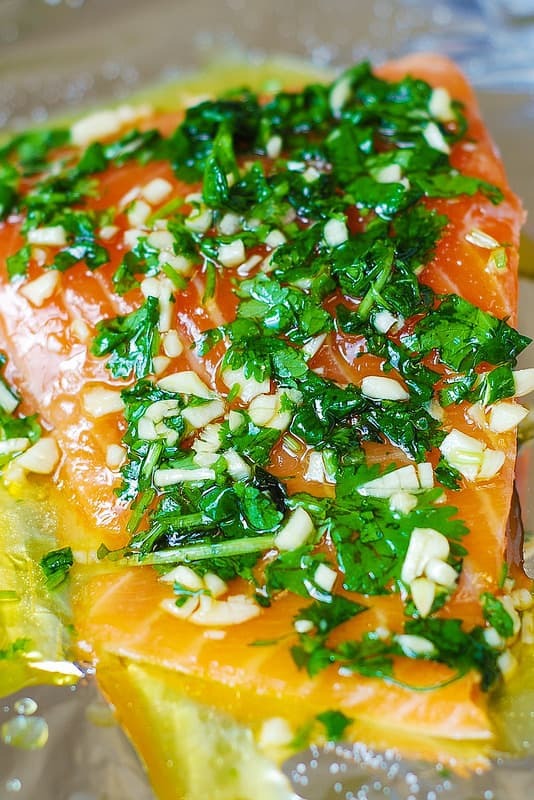 The combo of honey, lime and cilantro tasted sweet, tangy and not overpowering the taste of salmon. Healthy and calorie count pretty good, too. I could’ve eaten the whole pound of salmon and licked the plate. I had it with a side of marinated black beans, and the leftovers with side of brown rice. This recipe is simple to prepare and would be great for a dinner party. 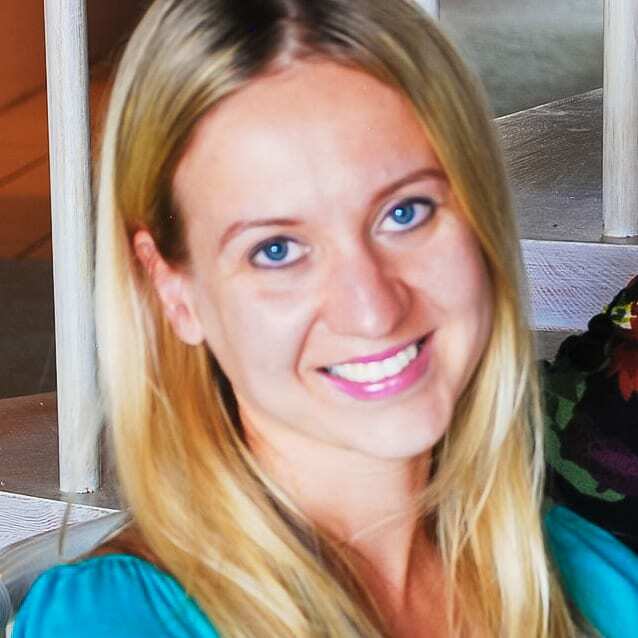 Thanks for sharing – I in turn shared this with others. Anne, I am so happy you enjoyed this recipe! Thank you for leaving such a thoughtful comment! This was soo soo soo good! The salmon was super flavorful with just a touch of sweetness. I usually have all of these ingredients except the cilantro and salmon in my pantry, so it turns into a pretty cheap dinner. We shredded the garlic on a microplane instead of chopping it just because we just learned we could do that to cut down on time. Keep up the great stuff! Delicious recipe! Quick question, is the 456 calories per salmon filet or for the 2 servings? Thank you, Carmen! I am glad you enjoyed this recipe. 456 calories is per 1 serving. The recipe makes 2 servings. So happy to read comments like yours! 🙂 Thank you! Just made this tonight for dinner. Delicious!!! I sprinkled cayenne pepper over the salmon before I spread the mixture to give it a little kick. Thank you for sharing your recipe. I will definitely make this again. So glad you enjoyed it! Sprinkling some cayenne pepper over the fish sounds delicious!